Rollashield Sliding & Folding doors provide a comprehensive range of insulated sliding & folding doors for use in many applications, particularly for large openings or where headroom is limited. 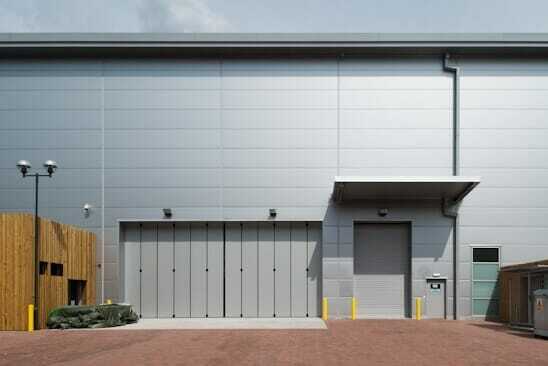 Rollashield BFI industrial doors are a fast-acting bi-folding door, available in widths up to 5700mm wide. This makes them an ideal choice for applications such as emergency services buildings and internal doorways in factories. The doors can also be manually operated if preferred. The doors have no bottom track and are a very reliable and durable door. The panel U-Value is 0.4 W/M2K and give a sound reduction of 25 dB for a whole door. The doors also offer Class 2 Watertightness and Air Permeability performance in accordance with BS EN 13241-1:2003. The panels can be in a variety of standard Plastisol colours or powder coated to a standard RAL colour. Other options include: vision panels, wicket doors and various operating systems. 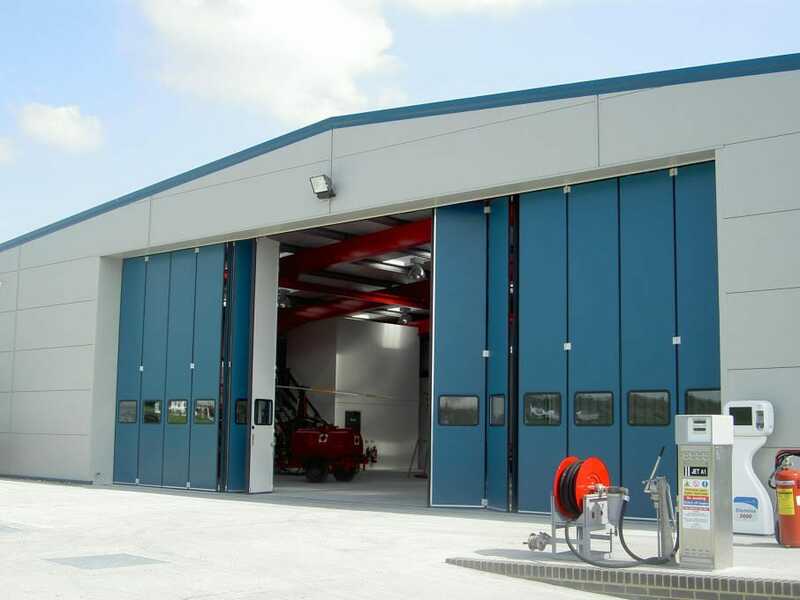 Rollashield SLI sliding industrial doors are available up to 30,000mm wide electrically operated or 100,000mm wide with manual operation. They are an ideal choice for applications such as factories, hangars and industrial units. The doors can be manually or electrically operated. The doors are available either top-hung or bottom rolling and utilise a sheaving system using single or multiple panels on up to 6 parallel tracks. The panel U-Value is 0.4 W/M2K and give a sound reduction of 29 dB through the panel. 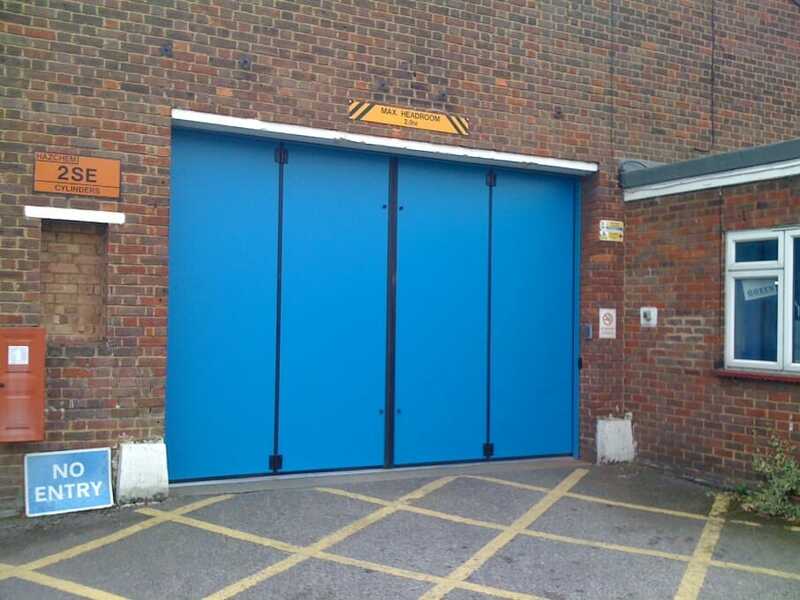 Electrically operated doors give an opening speed of 0.2m/sec (1-way) or 0.4m/sec (bi-part). The panels can be in a variety of standard Plastisol colours or powder coated to a standard RAL colour. Other options include: vision panels, wicket doors and various operating systems. Rollashield SFI sliding-folding industrial doors are top-hung multi-leaf door, available in widths up to 20,000mm wide. 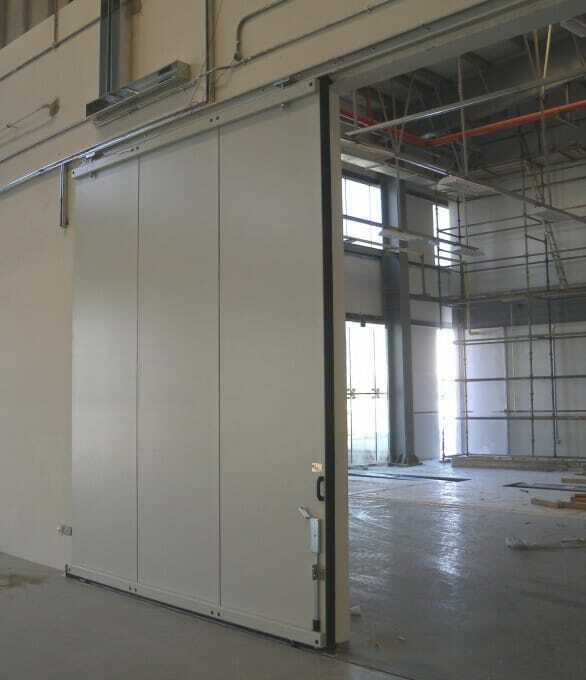 The doors stack clear of the reveals, folding inwards at 90° to minimise the side room required for the door to stack, this makes them an ideal choice for applications like factories, hangars and industrial units. The doors can be manually or electrically operated. The doors have a recessed bottom track and are a very reliable and durable door complete with heavy-duty EDPM weather seals. The panel U-Value is 0.4 W/M2K and give a sound reduction of 25 dB for the door overall. The panels can be in a variety of standard Plastisol colours or powder coated to a standard RAL colour. Other options include: vision panels, wicket doors and various operating systems.